Are You Muting Your Own Information? Are you killing your own information on Twitter? Everyday I see lots of great information on Twitter shared by some really amazing people, accounts and agencies. Some of this information is through running streams, while some comes through lists and more is found from just basic search parameters. But, one thing that shows up in almost every manner of information curating I see is the inexplicable Tweet that begins with a Twitter ID. I hear you right now, “Tim, if I am responding to someone, that is exactly how a Tweet should start!”…and I agree with you there. IF you are responding to someone that is exactly how a tweet should start. But, what I am talking about is just a basic Tweet, sharing information that begins with a Twitter ID that is not in response to, or mentioning an account for specific attention / purpose. Who is the audience for this post?? Why would I compose a Tweet starting with my own ID? I’m not responding to @TheIACP. I am providing an opinion statement, or information. Either way, by starting the Tweet with the Twitter ID, the only people who will see this Tweet are those that follow me AND The IACP. Let’s say there 100 followers between both account and out of those 100, 10 follow both The IACP and me…that means the potential audience to see that Tweet is 10, or in this case 10% of what it could be. Unless you are responding to someone, or speaking to that account, never start a Tweet with a Twitter ID. Instead, start the Tweet with anything else…most commonly a period ( .) or a word opens the potential audience pool. Using the IACP example above, If I have 50 followers, then the potential audience to see my Tweet is 50 people. Way better than the 10 who could potentially see it starting with the IACP ID. In the example below, you can see the use of the period which expands the potential audience of the Tweet. 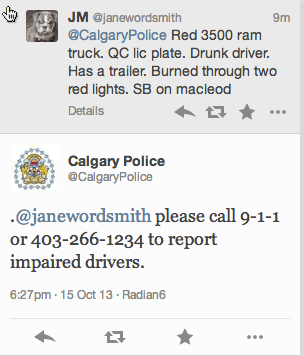 In this case though, the Calgary Police are actually providing information regarding a specific event in response to a Tweet they were mentioned in. The information/answer is so useful to the community at large, that to limit the response to just the account that posed the original Tweet would be a dis-service to their entire audience, so respond but add the period in at the beginning.